First Graders love Super Dog! 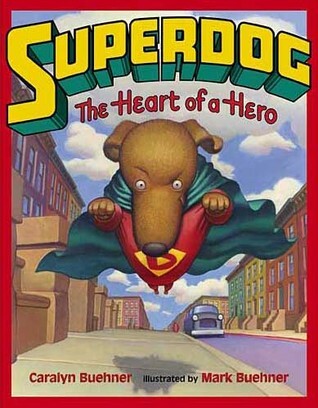 Caralyn and Mark Buehner came up with another hit in Super Dog: The Heart of a Hero. This is a great book to use for discussions of perseverance as a little dog with big ideas works very hard to achieve his goal. It even has a message about bullying and forgiveness–having a dog forgive a cat is no mean feat! Kindergarten–In honor of Jessie and Angie’s grandfather, who recently passed away, the staff donated to the Library a copy of The Giving Tree by Shel Silverstein. Jessie and Angie requested that we read it together and we all enjoyed the touching story. Second Grade–As I’ve said before, I’m always amazed (and happy) at how classic fairy tales literally grab the interest of students. This week the second graders heard Rumplestiltskin. This version is the one that is exquisitely illustrated by Paul O. Zelinsky. They were completely enthralled with the story. Third Grade–Third grade had check out only this week. Fourth Grade–This week we worked on the second literary element–setting. After discussing what went into the making of the setting in a story students heard a great example of how the setting almost becomes the main character in Pickles to Pittsburg by Judi Barrett. This book is the sequel to Cloudy With a Chance of Meatballs and tells what happened in the mythical town of Chewandswallow. Fifth Grade–Fifth graders reviewed reference books this week with a game of Name That Book. We divided up into teams of two and played “5 questions.” Each team chose one reference book and the “audience” had 5 chances to guess which book they had chosen. Then students did a “scenario” worksheet in which different problems were posed and they had to write down in which reference book would they find the answer. Sixth Grade–This week sixth graders did another World Book Online scavenger hunt. This time they were given the worksheet and had to go to the Portal, sign in, do the research, and answer the questions all on their own.